Had some surprise dental work today, so I let the kids make pizza bagels for dinner. I buy mini-bagels for the freezer when I see them at the bakery thrift outlet. Oh, my. Those look so good and today is grocery day! Yum! I make those for the day care children too. Sometimes we use a canned biscuit flattened out and then put sauce, cheese, and sometimes left over breakfast sausage or anything else I had in the fridge. Hope the dental work was not too painful. We do this with english muffins. So quick and easy, plus the kids can choose what they want on their pizza. Too funny, I just made these for lunch and took pictures and everything to put up on my blog next week. They were delicious! I'm doing the same thing now!! 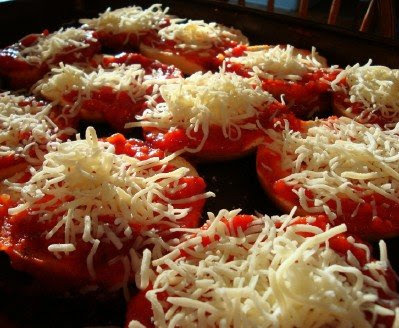 At Publix they'll often have the mini-bagels BOGO free, so I'll go ahead and assemble the pizza bagels (sauce and cheese) on a cookie sheet and freeze them individually. Once they're frozen I can put them in a freezer bag - and take out what I need. 450 frozen for 11-13 minutes. What a deal that is compared to Bagelfuls! We've made similar "pizzas" using tortillas, cheese and pepperoni. Up until she began tasting REAL pizza my 9 yr old loved them :) My son still eats them - super fast and yummy (at least to them). My husband loves these. We used to make them a lot after we first got married. A favorite treat for my boys - I think that's what we'll have for lunch today! These are fantastic and I love making them too! I love the bakery outlet here! However, sometimes you have to watch the prices! There is also a pantry where some folks go and get bread for 'free' - It is designed for the 'less fortunate', but I see lots of foreign cars and nice trucks in the lot where people who may not need it are going in there! These pizza bagels look yum-o!